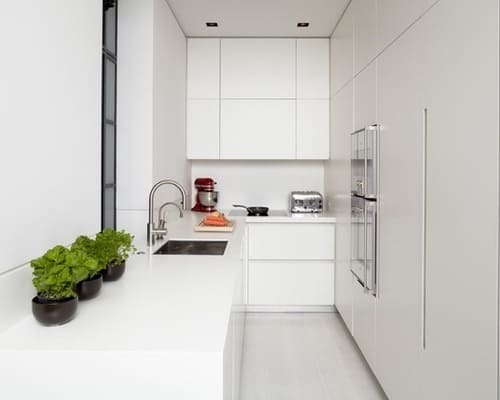 Small U-shaped kitchens are one of the most functional layouts in kitchen designs. They contain the three most important elements in a kitchen — the refrigerator, stove and sink — all within reach of one another. Because of this functionality, U-shaped kitchens are often installed in small spaces, in place of galley and other smaller kitchen designs. But this design can make the area feel cramped instead of functional. Proper planning and decorating can help to make it feel as open as it is useful. A Small U-Shaped Kitchen has a lot going on in one space. A busy or cluttered design can quickly overwhelm it, making it feel cramped and chaotic. Keep your decorating and design for the space as clean and minimalist as possible to help prevent this. Avoid decorative or busy backsplashes and use clean, solid-colored designs instead. Choose countertops that don’t have a lot of veining or bright colors and select cabinets that don’t have corbels, lattice or other busy elements. Whenever possible, keep your countertop appliances tucked away and keep any wall art outside of the U. Using one color in different shades or using different colors that are all the same hue helps keep a small kitchen from feeling cramped. Choose a wall color for the wall outside the U that is the darkest shade in the space. Use lighter versions of that color on the backsplash, cabinet knobs and hardware and for the countertop. Using the same color throughout the space tricks your eye into thinking the space is larger than it is. It also gives cohesion to the space. A well-designed floor pattern makes the space feel much larger than it actually is. If your Small U-Shaped Kitchen abuts another room, consider running the same flooring through both spaces. This helps make the kitchen feel larger than it is. If the kitchen is in an enclosed space, use the pattern of the floor to draw the eye. Lay tiles on a diagonal pattern, which draws the eye out to the corners of the room, visually enlarging it. Parquet tiles can also be laid this way. If you choose wood flooring, shift it to an angle and avoid straight lines. Because of the shape of U-kitchens, the eye doesn’t have a natural resting point. 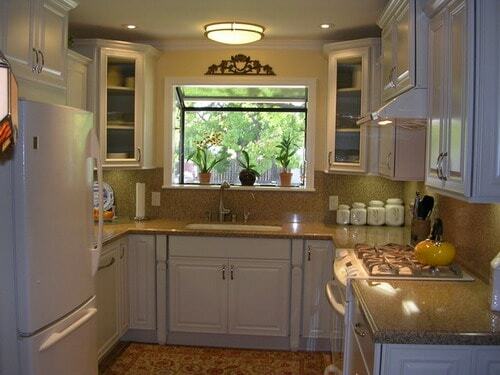 This is emphasized in kitchens where there is no window or a window off-centered from the sink. Giving the eye something to land on helps to anchor and cement the design. Some focal points that work well in small U-shaped kitchens include a backsplash panel behind a sink, stove or desk, decorative pendant lights above the peninsula and a wall of open cabinets that display decorative contents, such as pottery. Keep in mind that if you do include a focal point, you should stop at one; too much going on detracts from the design.